SANTA MONICA, CA (May 6, 2014) – Cordoba Music Group, the manufacturer of Cordoba acoustic guitars, ukuleles and accessories, has announced today that it has finalized a letter of intent to purchase the Guild® guitar brand and related assets from Fender Musical Instruments Corporation (FMIC). Sales of Guild guitars will continue as usual during the transition process. 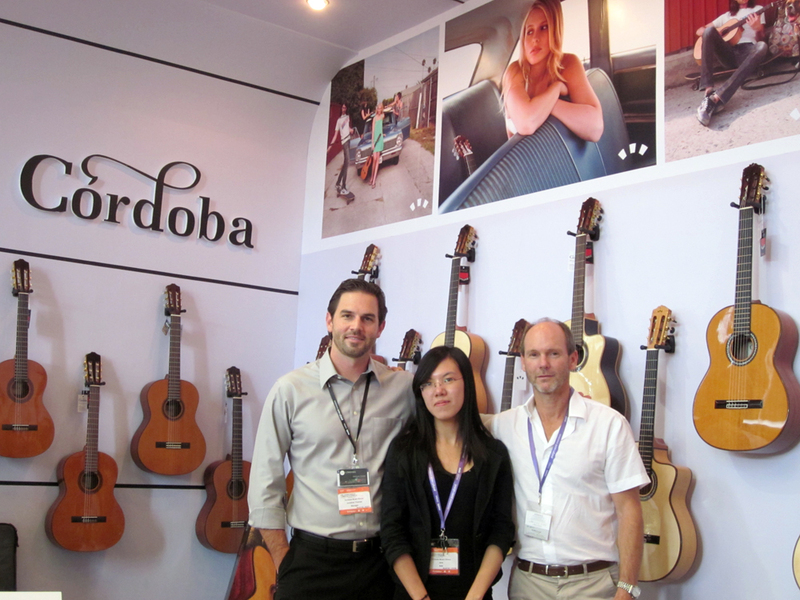 Upon finalization of the sale, Cordoba Music Group is expected to begin production of some models in Cordoba’s factory in Oxnard, Calif. FMIC recently announced the closing of Guild’s U.S. manufacturing facility in New Hartford, Conn.
About Cordoba Music Group: Cordoba Music Group is a musical instrument manufacturer and distributor specializing in acoustic guitars and related accessories. CMG owns and operates the Cordoba brand, the industry’s leading nylon string acoustic guitar brand, and handles U.S. distribution for Savarez®, Aquila®, and HumiCase®. For more information, visit www.cordobaguitars.com. About Fender Musical Instruments Corporation: Fender Musical Instruments Corporation (FMIC) is one of the world’s leading musical instrument manufacturers, marketers and distributors, whose portfolio of brands includes Fender®, Squier®, Gretsch®, Jackson®, Takamine®, Guild®, EVH®, Ovation®, Charvel® and Groove Tubes®, among others. For more information, visit www.fender.com. Nashville opened up their brand new Music City Center to host the biggest Summer NAMM show in the past five years. 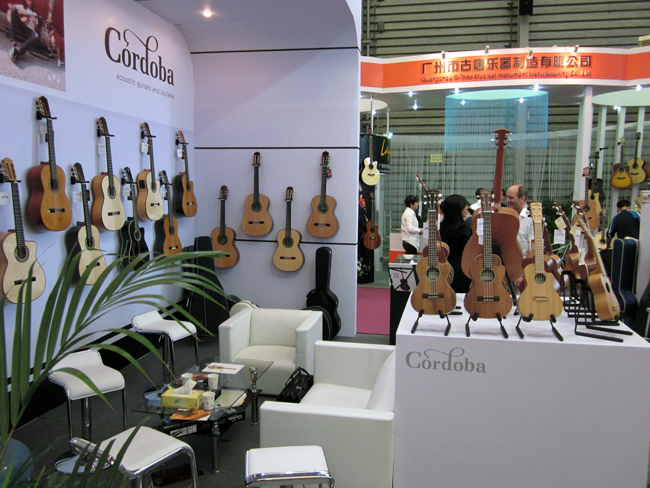 With tangible energy and excitement in the air, Cordoba proudly displayed a selection of our newest and finest instruments, including the USA Made Master Series, all solid 30 series ukuleles, and our well-established Luthier and Iberia series. With a steady flow of dealers, artists, magazines, and Cordoba enthusiasts streaming in at all times, we sure stayed busy! 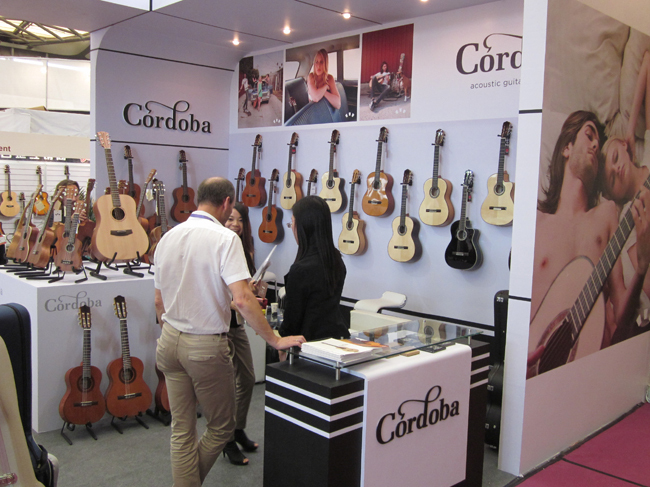 Cordoba has been on a steady upward climb over the last few years, as we strive to make the best nylon string guitars and ukuleles on the market. It seems as though our efforts and perseverance haven’t gone unnoticed – we’re thrilled to announce that we received the NAMM Board’s Best in Show Award for the “Company to Watch”! We’re indebted to and extremely grateful for those who have supported us over the years, and we promise we’ll live up to (and surpass) the hype. Stay connected with us by following us on Instagram and Facebook! Our Cordoba California Custom Shop is featured in the Summer NAMM issue of Music Trades. Click here to read the article! 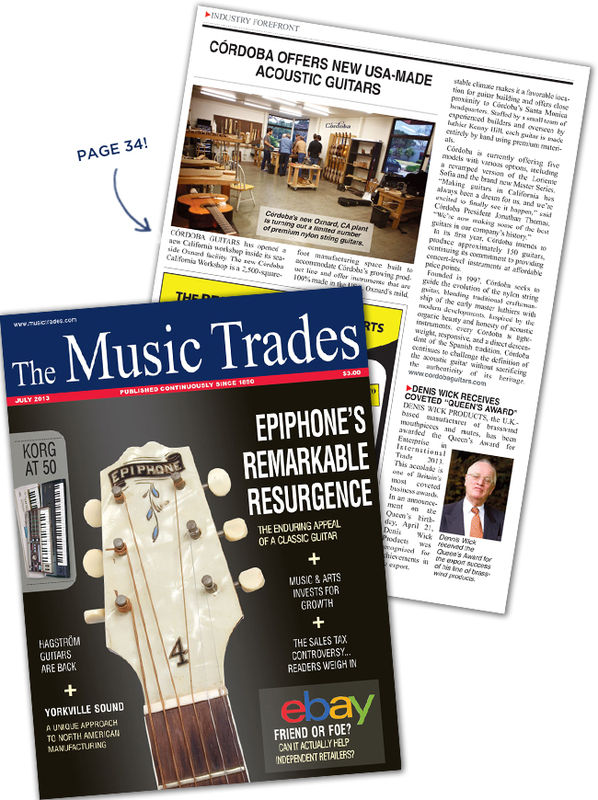 We were honored to be featured in the April 2013 Music Industry Census issue of Music Trades. Click the image above to read the full article! 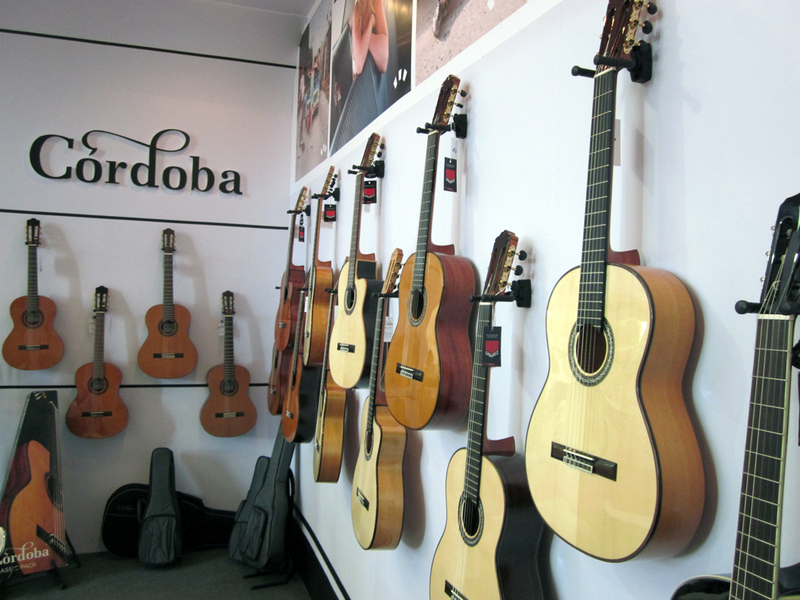 SANTA MONICA, CA –Cordoba Music Group has donated 50 Cordoba guitars and cases in support of UCLA Community School’s Creative Expression Seminar Series. UCLA Community School is a UCLA-supported school located in one of California’s most high density, high poverty, and underserved neighborhoods in the mid-Wilshire/Pico Union area of central Los Angeles. Students actively participate in guiding their own education, and the Seminar Program provides various engaging opportunities for students to explore new interests and develop their skills. Part of the school’s Creative Expression series, and taught by 7th grade teacher Andre Feng, the semester-long “Guitar Heroes” program will run in both the fall and spring of this year. Middle school students will learn everything from the guitar’s anatomy to the works of Bob Dylan and the Beatles to an introduction to music theory. For those whose passion has been piqued beyond basic chords and strumming patterns, Music Theory is offered as a separate upper school course. Firm believers that a child’s first guitar makes a lifelong impression, Cordoba Music Group is proud to provide students with the tools they need to begin and pursue their musical endeavors. More info published on On Post and on UCLA’s website, Ampersand. Cordoba Music Group co-hosted a sweepstakes with Jose Ramirez Guitars earlier this year. The winner of the sweepstakes won a trip for two to Madrid, Spain including a private tour of the Jose Ramirez Workshop and Museum. Amalia Ramirez, her nephew, Enrique, and her foreman, Ricardo, showed them the ins and outs of how they handcraft their beautiful guitars. Here are a few photos from this once-in-a-lifetime experience! Head on over to Ramirezguitars.us to check out the newest 130 Años model. This new guitar is built with a solid Red cedar top and Indian rosewood back and sides. It features a beautiful Cherry blossom rosette, chosen to to symbolize warm wishes for people of Japan after the March 2011 tragedy. 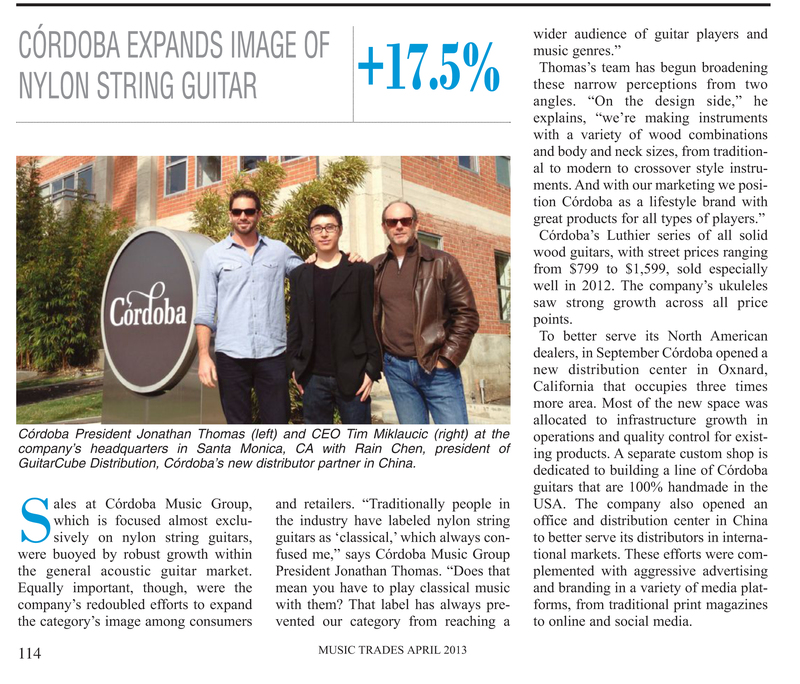 Cordoba Guitars in Music Inc.
Cordoba Guitars was featured in this year’s February issue of Music Inc. If you missed this issue, check it out by clicking the image above! 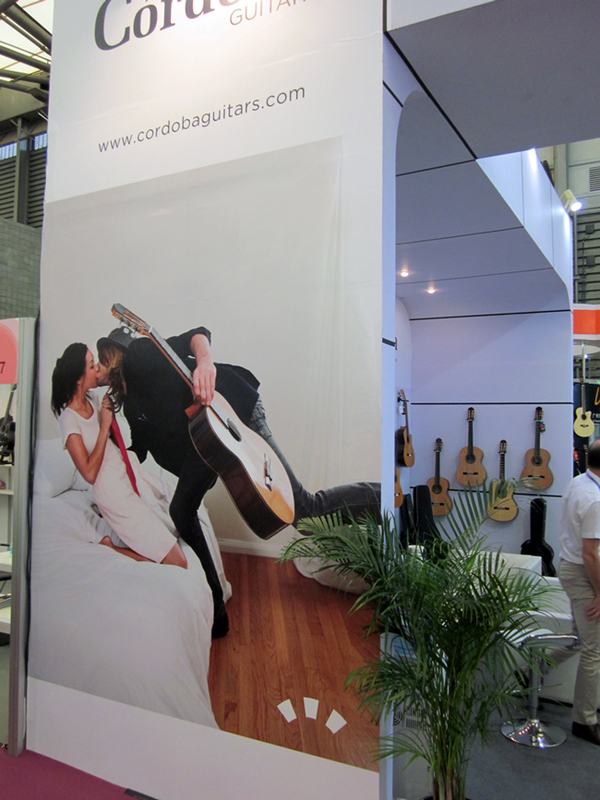 Cordoba Guitars made its first appearance at the Music China show in Shanghai. We brought some of our best selling guitars, ukuleles and accessories as well as new models that are set to launch officially in 2012.